If you want a lawyer in Statesville, NC who is willing to go the extra mile to resolve your problems, give me a call. Sometimes life throws us a curve ball and you find yourself in need of a lawyer. It can be confusing to know who to turn to when you are already deeply stressed about your situation. What you really need is not only a knowledgeable lawyer, but also one who is understanding of your problem and needs and willing to go the extra mile, so you can put the problem behind you. This is the type of lawyer you will find when you visit with me, W. Sloan Goforth, Attorney at Law. The key areas of the law I focus on include traffic violations, criminal cases, DWI, family issues (including divorce and custody), personal injuries, disability claims, and estate planning. I can help you whether your problems are personal in nature or related to your business. One of the most important things a lawyer can do is provide accurate information about local, state, and national laws. Doing an internet search about how to manage a traffic ticket won’t do any good if you’ve looked at the local laws for a city in Wisconsin. Every state has different regulations and ways of handling legal matters, and a local attorney will have you headed in the right direction. A local attorney is also a great resource when you need legal defense for a case. While you can choose to represent yourself in a court of law, often having an attorney on your side is the best choice when you need someone who knows how to navigate the court system and can develop the best defense on your behalf. Finally, a lawyer can inform you of your rights before, during, and after any legal matter where your freedoms are involved. This can help you feel as though you have someone in your corner for the duration of your case. Before you take matters into your own hands, call an attorney for help! I want to be the lawyer you turn to whenever a legal dilemma comes along, so my staff and I work to build a relationship with our clients and get to know them. If you live in the Statesville, NC area, we welcome you to call us for a free initial consultation. You can also call to retain me as your lawyer. That way, when something does happen, you won’t have to wonder or worry about who to call. I care about the Statesville community, as I went to school in North Carolina and enjoy many aspects of community involvement. I am proud to offer those in need the best legal representation I can possibly give. If you want a lawyer who is willing to go the extra mile to resolve your problems, give me a call. You won’t be disappointed. 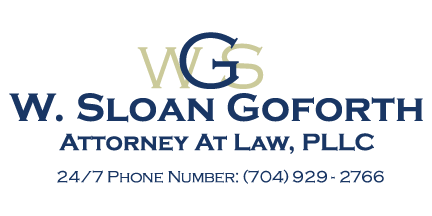 At the office of W. Sloan Goforth, Attorney at Law, our lawyer proudly serves residents of Statesville, Troutman, Taylorsville, Mocksville, Mooresville, Hickory, Iredell County, Alexander County, and Davie County, North Carolina.